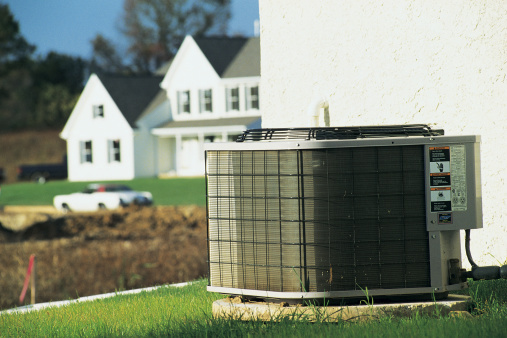 Should You Leave an Air Conditioner Running During a Thunderstorm? When a thunderstorm is imminent, the air is often hot and humid, and that's just the time when you want your air conditioner the most. Both temperature and humidity will drop when the storm hits, though, and until that happens, it's probably worth putting up with some discomfort and shutting off your air conditioner. A thunderstorm almost always brings lightning, and a well-placed strike can seriously damage your unit if you leave it running. Lightning is possible whenever you hear thunder, and you can suffer a strike even if a storm seems far away. A positively-charged lightning bolt travels above the clouds and can strike 10 miles or more from its point of generation. Lightning strikes are statistically rare, but they are definitely possible, and one of the most vulnerable points on a house is the electrical service drop located on the roof. A strike there could cause five billion joules of energy to travel through your electric wiring for the fraction of a second it takes your breakers to trip. That's enough energy to toast 100,000 slices of bread with a 1,000-watt toaster, and it's enough to make toast out of your air conditioner. Air conditioners are electrically insulated for safety, so it's doubtful the casing will become electrically charged or hot during a lightning strike. Moreover, because the refrigerant in the air conditioner is nonflammable, there isn't much danger of an explosion. The power surge may melt the plug and receptacle if your unit has a plug, and it will damage the delicate electrical circuitry in the appliance's control panel. The repair will be a major one; you may even have to replace the unit. 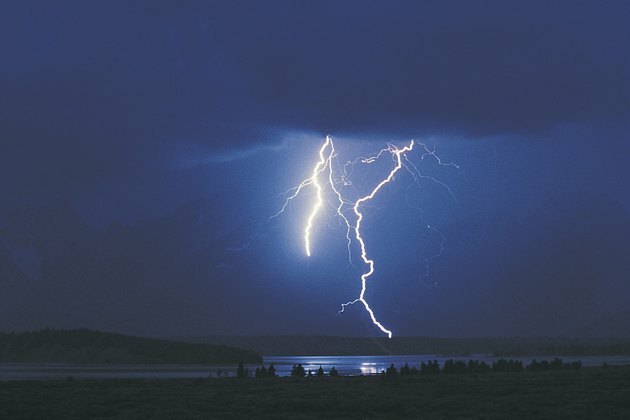 If you have a central cooling system with an outdoor compressor, lightning could knock out the controls to your entire heating and cooling system if it hits while the unit is running. You can't protect your air conditioner by plugging it into a surge protector. These devices are intended to guard against power spikes but not the surge of a lightning strike. If you live in a lightning-prone locality, your house should have a protection system consisting of lightning rods, conductor cables and ground rods. This type of system provides an alternate path to ground so lightning doesn't travel through the house circuitry. Even a lightning rod system doesn't provide fail-safe surge protection for sensitive electronics, such as the control panel in your air conditioner, so it's still safer to turn off the air conditioner during a storm. Whether yours is a window-mounted unit or a central-air system, it normally isn't vulnerable to rain. The compressor and condenser motors are both mounted in the outdoor part of the unit, and although they have to dissipate heat to function properly, rain doesn't interfere with this process. You normally wouldn't run the air conditioner during a period of freezing rain, but when it's simply drizzling or raining, running the air conditioner can be beneficial. The evaporative coils, which are inside the living space, draw moisture from the air and lower the humidity, which can make the space more comfortable on warm days.